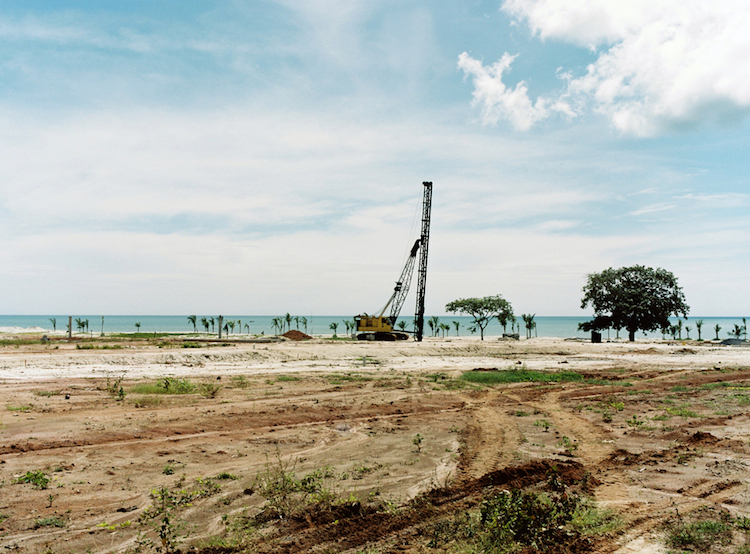 fototazo: The Image: Lorena Endara, "Construction site, Farallon, Panama, 2008"
The Image: Lorena Endara, "Construction site, Farallon, Panama, 2008"
Once I heard something about how each picture you take is autobiographical. When I first heard this I thought it was a great editing strategy. I liked that this idea forces you to keep very high standards so I kept it in mind. I took this image in 2006 when I was just beginning a long-term photo project about my native country, Panama. At that time, Panama's economy was booming and the entire country was undergoing a major transformation. There were new buildings everywhere and the country seemed like a playground for investors and construction companies. For me, it was a playground for finding metaphors and building narratives through the landscape. I spent a lot of time thinking about the assumptions around development and progress and how these speak to power. Many years later, I now look at this photograph and I see myself in the strong straight lines, surrounded by soft curves. The bright colors remind me of all the sunny days I would love to spend by the beach. This intimate moment brings back the fresh ocean breeze and the thrill of trespassing.